John Cachero Photography had the pleasure of photographing Jen and John, who celebrated their wedding reception at the Gwinnett Environmental And Heritage Center just outside of Atlanta, Georgia. Having had an intimate destination wedding in Hawaii, they decided to have a Hawaiian-themed reception for the rest of their family and friends back on the mainland. I was especially honored to have been asked to shoot their reception because John is a great friend and fraternity brother of mine. This is my gift to them. 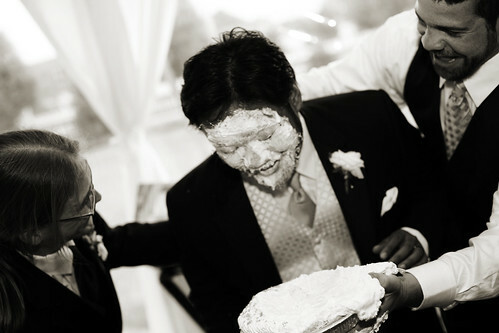 At the end of this post, I included photos documenting our fraternity's time-honored tradition of delivering a pie to the face of a brother on his wedding day. We usually TRY to coordinate with the hired photographer roughly when it's going to happen, but in this case, obviously, it wasn't going to be a problem. In fact, I helped set John up for the hit by insisting that he pose for a photo with his Hampton Roads buddies who were also in on the plan. First, John's actual brother, Robbie hit him with a pie from behind which, for whatever reason, didn't stay stuck on his face. That's okay, because Kevin hit him with a second pie to finish off the job. Good times. John and Jen, congratulations! I know you two will take care of each other wherever life takes you.